On March 10 2012, the publication ‘The Dutch Photo book’ was presented at the Nederlands Fotomuseum, a book containing a selection of 124 books published between 1945-2010 that describes the relatively recent history of the famed Dutch photo book. I am very proud and honored to see my book ‘ Phantom City’ in the selection on page 184. Published by Nai Publishers, ed. Frits Gierstberg, Rik Suermondt. The Dutch Photobook describes the relatively recent history of the famed Dutch photobook. Editors Rik Suermondt and Frits Gierstberg chose over 120 of the most significant Dutch photobooks and placed them in the context of developments in photography and society. The post-Second World War Dutch photobook is unique because of the long tradition of graphic designers and photographers working closely together. It is highly prized abroad, and many photobooks have become part of the collections of museums and private collectors. This book shows the immense variety and allure of the Dutch photobook and makes it accessible to a broad audience. Six chapters, organized both thematically and chronologically, examine company photobooks, photobooks about youth culture, landscape books, city books, travelogues and autonomous photobooks. For each theme, the 20 most noteworthy books are described and represented by gorgeous illustrations of their covers and parts of their contents. In September 2011, another book about photo books, this time about Germany in the Photobook - ‘Deutschland im Fotobuch’ - was published by Steidl (ed. Thomas Wiegand, Manfred Heiting): ‘Niemandsland’ can be found on page 305. Welche Fotobücher haben auf besonders überzeugende und charakteristische Weise Einblick in »Deutschland« gegeben? Deutschland im Fotobuch zeigt sie: Bücher aus den letzten Tagen des Kaiserreichs und der Weimarer Republik, aus dem »Dritten Reich«, der Bundesrepublik, der DDR und dem wiedervereinigten Deutschland. Viele wichtige Fotografen sind mit gestalterisch geschlossenen Werken zum Thema vertreten: August Sander und Albert Renger-Patzsch, Abisag Tüllmann und Edith Rimkus, Leonard Freed und George Hashiguchi, Dirk Reinartz, Chargesheimer, Will McBride, Heinrich Riebesehl, Christian Borchert u.v.a. Deutschland im Fotobuch versammelt 273 Werke, die mit Beispielseiten, einem kurzen Text und bibliografischen Daten vorgestellt werden. Der Band ist in thematische Gruppen gegliedert: Landschaften, Städte, Menschen, Arbeit, Architektur, Zeitgeschehen, Grenzen, »Typisch deutsch« u.a. Jedes Kapitel wird von einem Essay eingeleitet. Both books can still be ordered at my web store here. Point of departure of the group exhibition Behind the Bill Board with work of four Dutch and four German photographers, is the idea of malleability of an identity. This central idea of constructing an idea – of a city, a product or a person – manifests itself on different levels within this exhibition. Some of the artists investigate the photographic medium in relation to the reciprocity of image and identity. others show us a constructed or deconstructed ‘outside’, where the malleability of our society and environment as well as its limitations become visible. 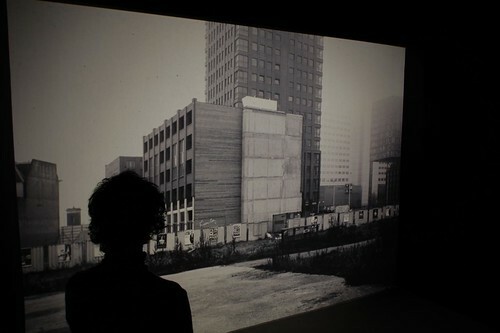 In January 2010, the collaboration between these female German and Dutch photographers started off with a first show titled ‘NowHere’ at the CBK in Rotterdam with the intention to bring the show to the other city: Berlin. For this ’sequel’, we as photographers invited Caroline von Courten as a curator and producer. From May till October 2010, 6 artists from Rotterdam each worked one month in the residency ‘1 maand Marxloh’, in Marxloh – Duisburg. The residency was founded by artists Kim Zieschang and Arnoud Schuurman,who invited the artists to relate with their works to the urban context of Marxloh in particular and the Ruhr area in general. The exhibition, housed in a beautiful vacant store, brings together different points of view on the region by means of photography, drawings and sculpture. The exhibition will be opened in presence of the artists by Aslı Sevindim, Artistic Director of Stadt der Kulturen Ruhr.2010, Heiner Maschke, Geschäftsführer der Entwicklungsgesellschaft Duisburg, Felix Eich, Kulturreferent General Consulate of the Netherlands and Kim Zieschang und Arnoud Schuurman, initiators ‘1 maand Marxloh’. 1 maand Marxloh was made possible with financial support Municipal Services for Art and Culture, Rotterdam, Centrum voor Beeldende Kunst Rotterdam; the Kingdom of the Netherlands in the framework of NL-RUHR; the Entwicklungsgesellschaft Duisburg [EG DU], the European Center for Creative Economy [ecce] and the Kulturhauptstadt Ruhr.2010. 1 maand Marxloh is a project from Modile e.V. In June 2010, the book ‘Home’ by VMX Architects was published (SUN Publishers). For this book, I photographed 16 housing projects in the Netherlands designed by VMX in the last 15 years. Graphic designers Mevis & van Deursen and VMX contacted me because they were looking for a different approach towards architecture photography for their book. In books about architecture, the architecture is most often photographed when still brand new, unblemished and uneffected by use and wear of its inhabitants, therefore showing quite an ‘unreal’ image of architecture. This makes sense, when one considers architecture photography to be an important marketing tool for architects to promote their works with images that pay homage. The book is also meant to function as a study book. It includes a text by writer and journalist Marina de Vries, who is also living in one of the housing projects by VMX. The book is made out of 16 different chapters, one for each housing project, each consisting of an introduction text, the technical drawings and my images from the project taken inside and outside. The housing projects that I photographed range from building projects still in preperation, commissioned family homes, to large social housing projects. The book was made in a very short period of time, but still resulted in a challenging book that illustrates a very fresh and open minded attitude towards what architecture and its representation is and how this could be presented in a book in a different way. An aspect that became a focus for my images, was how the inside world of the architecture of VMX and the outside world related to eachother, how inside and outside are experienced in parallel, as a kind of osmosis of the senses. Having such an open minded architecture firm and Netherlands’ most prominent graphic designers asking me to apply a different approach, photographing their projects in their full functioning existence and giving me freedom to interpret the commission in dialogue with them, was a very exiting challenge and experience.